On an integrally carved naturalistic base; the reverse hollowed out; label on the underside with attribution. M. Baxandall, The Limewood Sculptors of Renaissance Germany, New Haven and London, 1980, pp. 191-202, 226-274, fig. 122, pl. 39. Although there is debate about Veit Stoss' place and date of birth, it is known that in 1477 he left Nuremberg for Cracow, where he was employed by the German commercial colony and the Polish Court. He returned to Nuremberg around 1496 and continued his successful career there until his death in 1533. The present piece, with its typical 'paper-like' folds, in the words of Giorgio Vasari, who wrote about Stoss' Saint Roche in the church of Sta Annunziata in Florence (op. cit., p. 191), reflects the mastery Stoss displayed in his virtuoso carving of drapery. 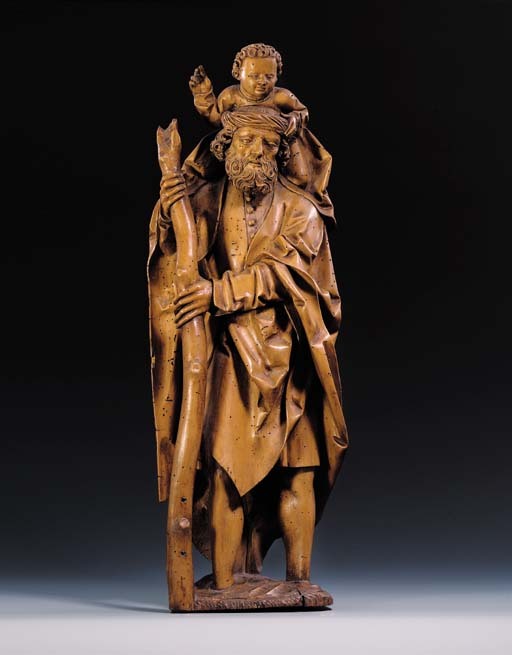 The curls of the beard, the expressive, slightly melancholy features of Saint Christopher and the round-faced Christ Child with his tight curls of hair are all characteristic of Veit Stoss' work. It has been suggested that with its slightly stiff posture and drapery, the present group belongs to an early phase of the artist's career.